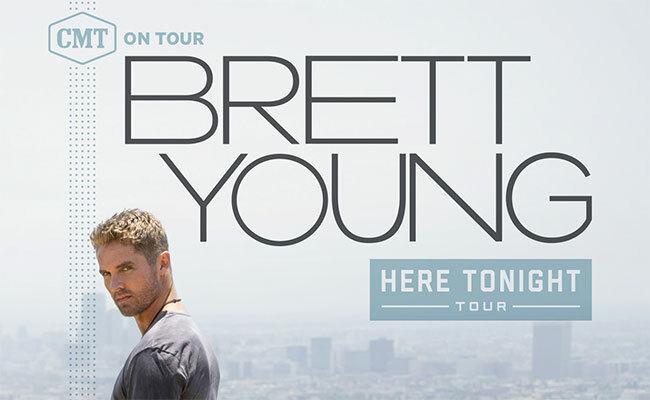 ACM Awards New Male Vocalist of the Year Brett Young will bring his “crowd-pleasing” (Arizona Central) set to fans across the country this fall with CMT On Tour: Here Tonight. The headline dates follow last year’s sold-out tour and will launch November 16th in Royal Oak, MI. Drawing from his debut platinum-certified self-titled album on BMLG Records, Young’s four consecutive platinum No. 1 chart-toppers will set the pace each night as he also previews new music and continues to captivate crowds “like a seasoned pro” (The Press-Enterprise) with his “flawless vocals” (Billboard). Featuring special guests Tyler Rich and Rachel Wammack, tickets for CMT On Tour: Here Tonight go on sale in select markets this Friday, August 24th at 10 am local time via BrettYoungMusic.com. Additional markets will be announced in the coming weeks.